Though I was every impatient to meet Prince Caben—this is what happens when you read excerpts before reading the book, lol—Of Silver and Beasts captured my attention from page one! It built an amazing world that was a mix of modern technology and historical times, and mercury was the currency of the realm. And I loved the blend of different fantasy cultures and beliefs. Of Silver and Beasts was a thrilling adventure that simply kept me glued to its pages. Now at first, I really wasn’t sure what to make of Kal at the beginning as a character. Overall, I really liked her, but when I first got into her head, she seemed a bit cold and hard to understand, at least until she started revealing bits and pieces of her past. And even then she was sort of closed off. But the more she let herself live and grow, the more I began to like her—even relate to her. And then there was Prince Caben! YUM! He didn’t appear quite as fast as I would have liked, but at least he made an entrance. Caben has to be my ultimate Book Boyfriend crush, currently. Not only is he majorly swoon worthy—especially in chapter 24—but he was really the one who helped Kal grow throughout the novel. Plus, the clash of egos between the two of them was very entertaining. They were PERFECT for each other! I also found the Otherworlders fascinating! I would say their appearance, cities, and life style were almost a mix from Morlocks, Orcs, and Wraths (Stargate Atlantis) in my imagination. Bax especially reminded me of my favorite Wrath from SG Atlantis, Todd. Bax intrigued me the moment he came into play and helped me see the events from another interesting view point. Altogether, I have to say Of Silver and Beasts totally ROCKS!!! If you like action thrillers such as the Hunger Games, then this is a definite must read! And even if you don’t, I would still highly recommend adding it to you TBR list and giving it a try. It is so worth it! And the ending has a heart-wrenching twist you will never see coming! Logically, that makes sense. But the heated look he’s giving me says so much more. And regardless of the attraction I may feel for the prince—a woman would have to be blind—and whether or not we actually escape this hell … what then? We share an intimate moment once, and go back to our stations in life, simply pretending nothing happened? Or maybe I’m reading too much into his gaze. He’s a man, and physical desire is self-serving. He may die … and he probably wants to bed a woman one last time. Everything about his character screams he’s not one who thinks past the moment. Trisha Wolfe is the author of the YA Steampunk DESTINY’S FIRE (Omnific Publishing), the NA Historical/Supernatural ASTARTE’S WRATH, and the upcoming YA Utopian FIREBLOOD from Spencer Hill Press, October 2013. 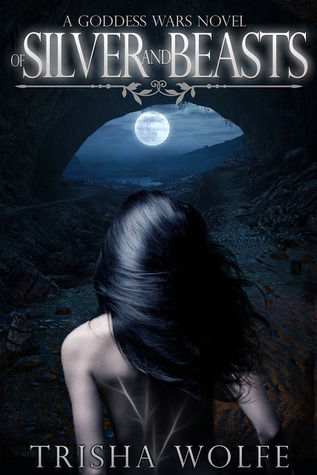 Her NA Dark Fantasy OF SILVER AND BEASTS available May 2013. She’s the creator of YA Bound, a promotional site for the Young Adult genre. Also a member of SCWW and The Apocalypsies. Check out www.TrishaWolfe.com for more on her books and bonus material. Follow Trisha on Twitter @TrishWolfe and like her Facebook page for updates. Previous postClear Your Shelf Giveaway Hop! Need to get this book!